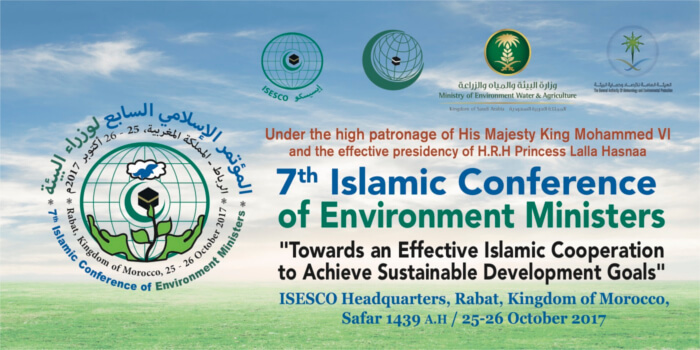 Under the High Patronage of His Majesty King Mohamed VI and the effective presidency of H.R.H Princess Lalla Hasnaa, The Islamic Educational, Scientific and Cultural Organization (ISESCO) in cooperation with the General Authority of Meteorology and Environmental Protection of Kingdom of Saudi Arabia (KSA) and the Organization of Islamic Cooperation (OIC), holds the 7th Islamic Conference of Environment Ministers on the theme of “Towards an effective Islamic Cooperation to achieve Sustainable Development Goals”. The conference is organized within the framework of the Global Development Goals (GDGs) and is based on the Ten-Year Programme of the Organization of Islamic Cooperation and the efforts of ISESCO and the General Authority of Meteorology and Environmental Protection towards fulfilling these goals. Representatives of all OIC Member States and Ministers of Environment and Organizations are expected to attend this event. The Report of the Fourth Meeting of the Islamic Executive Bureau for the Environment. The Report of the Director General on ISESCO’s Efforts in the Fields of Environment and Sustainable Development between the 6th and 7th. The Report on the Creation of the Joint Committee on the Executive Work Plan for Natural Disaster Risk Reduction and Management in the Member States. On this occasion, the attendees will also discuss the drafts documentation on “the Green Cities and their Role in Achieving Sustainable Development Goals, “the Celebration of Islamic Capitals of the Environment and Sustainable Development”, “The Amendment to the Rules of Procedure of the Islamic Executive Bureau for the Environment” and “The Rules of Procedure of the Islamic Conference of Environment Ministers”. This conference will be also the occasion for winners of the Kingdom of Saudi Arabia Award for Environmental Management (KSAAEM) in Islamic World to be awarded for their outstanding works in the Environment field. The closing session will be will be devoted to the election of the members of the Islamic Executive Bureau for the Environment and the date and venue of the 8th Session of the Conference of Environment Ministers.